Hotline Miami the original was an indie darling, a top-down murder simulator with tight controls and a difficulty curve that fit precisely into the deranged zeitgeist of video gaming circa 2012. Its amazing retro-80s soundtrack and simple premise (murder everyone, with whatever you got) drew from hyperviolent pastiches like Drive. 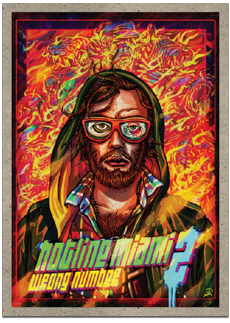 I’m happy to see a company quit while it’s ahead; this sequel will be the last in the Hotline Miami franchise. Maybe, for the best: Cara Ellison at PCGamer broke down an uncomfortable moment of simulated sexual assault in the playable demo. However, I’ve found Dennaton Games to be responsive, apologetic, and honestly empathetic in their response. Hotline Miami was always a video game that understood its audience. I hope the sequel is an elegant swan song for the series, and that they keep pushing for good gaming after Wrong Number. Steam (Windows) – iPad/IPhone release forthcoming? Whether you love the franchise or hate it, Scott Cawthon is back with a third installment of Five Nights at Freddy’s. The classic premise of the game is still there; you are still a night watchman who must keep the murderous animatronics at bay until 6AM, but this newest iteration of the series takes the murky history of the game’s world a step further into meta. You are now monitoring a soon-to-be-opened haunted house attraction, based on the Freddy Fazbear lore of the previous games. Your chipper bro-dude boss (known heretofore as Phone Dude, not to be confused with Phone Guy) calls in on the first nights to let you know about the attraction’s progress with collecting ‘legit’ relic animatronics to populate the space. Fortunately for you, there’s only one animatronic they’ve managed to find, so there’s only one animatronic for you to worry about … right? Moon Studios is trying to create a game that will remind you of all of the amazing games that came out in the 90s. A coming-of-age story about a forest spirit where each background looks like a painting. It’s a 2D game that focuses heavily on the story. I’m hoping for great things with this one. I am a sucker for animals. I really enjoyed the first Shelter and how it told a story of peril, survival, and the inevitability of life without needing a big, bombastic plot or setting, and with no real dialogue. It was a bittersweet, tear-wrenching endeavour and I am excited to see how far they can push a similar story but in a different setting this time around, with a mother Lynx and her cubs. The introduction of actual seasons as well as the ability to name each cub and carry them over to the next generation of the family tree in consecutive playthroughs sounds incredibly interesting. It’s a nice bit of added variety that will help flesh out the natural world Might and Delight have carved out. As well as that the art remain just as gorgeous as ever, reminiscent of children’s storybooks, with each object and living thing looking like it was hand whittled from wood blocks and painstakingly hand painted with care and attention, patterns on each surface also resembling wood and lino-cut prints. I really enjoy stuff that engages with you emotionally first and foremost, and adding this level of interactivity along with the added sense of empathy you would have for any woodland critter just speaks to me on some near-indescribable level.